Tomorrow my new sports themed exhibition starts in Vera (Almeria). For this occasion, and with the intention of sharing the real exhibition with our visitors here, Goodaboom purchased a new, wonderful toy: a 3D Gallery ! I just hope you will be patient enough to wait till the end of the initialising, but if not, the paintings are available a to view online in a flat way! To embed the 3D Gallery into Goodaboom was quite complicated, as the existing structures were not exactly compatible. In my fight to get it just right, I guess I have sent some webmasters of this world insane! But the hardest challenge has been for me to speak the welcome and a small message into the microphone, above all in English. I had never done that before in my life! The first trials were awful, as the moment I should start to speak I was convulsed with giggles. Each take ended in a riot of laughter, not only but also from my sound master. We had to give up. The next day, I was not in such a light mood and the recording was more simple, I needed a mere 3 trials. Kevin spent then a lot of time repairing the German „ist“ which I spoke instead of the English „is“. I didn´t care, but Kevin was categoric: NO! Anyway: you can hear the result in the 3D Gallery. Thanks to Kevin´s wonderful music especially composed for this 3D exhibition, I may not sound too silly... But it is a strange feeling to know, that my voice can be heard around the whole world now! As I normally have a good ability to represent movement in painting, I was asked some years ago to make a series about sport. I was quite successful with them. I exhibited twice, and then I put them in a folder and forgot them again. (as it happens to many of my paintings!). We were thinking of a theme for the new exhibition In Almeria, and Kevin thought they would be ideal for that. 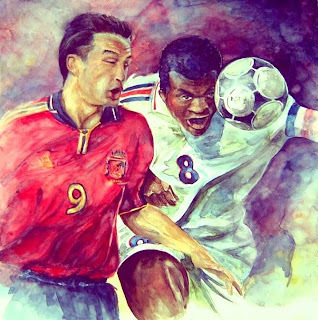 There is a nice anecdote to the football painting: when the paintings were exhibited earlier in a restaurant here. One day a seven year old spanish boy came into the restaurant and said, that he wanted to buy the footbal painting. He had come before with his parents and stood a long time in front of it, instead of eating, the owners told me. They asked the boy if he had money, He smiled, opened his hand and showed... a 1000 ptas note (about 6 euros). They told him it was not enough. he shouted, quite sure that this was the right argument. But well, the business world is hard and he had to leave with empty hands... and tears in his eyes! As I heard the story some days later, I became very angry with the restaurant owners. Honestly: I would have sold the painting to the little boy at this price... just hoping that it was not a trick from his parents!